DR-HO'S Pain Therapy Massage Belt is a 3-in-1 Belt that helps to relieve discomfort in the lower back. Powered by DR-HO'S Pain Therapy Device, the Pain Therapy Massage Belt has built-in electrodes for TENS, EMS and Pulse Massage Therapy, a back support air cushion for low back support, as well as a thermal pocket for heat patches or small ice packs for hot or cold therapy. One size fits most. 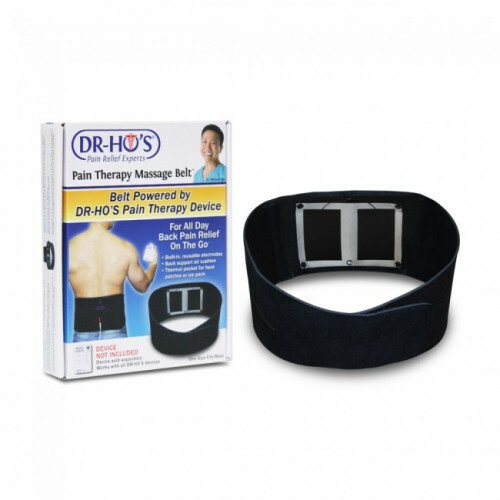 DR-HO'S Pain Therapy Massage Belt is designed for use at home or on the go. Discrete under clothing and made with snag-resistant material, the Massage Belt can provide maximum relief for all activities. DR-HO'S Pain Therapy Device is a registered medical device clinically tested to improve blood and nerve circulation, decrease muscle tension and pain, and improve tissue oxygenation. The large reusable massage pads will help to soothe discomfort in the lower back to help relax tense low back muscles and improve circulation in the area. Powered by just 2-AAA batteries, the Pain Therapy Device and the Pain Therapy Massage belt is portable and can be used anywhere. The Pain Therapy Device has 3 modes with 12 different massage techniques, as well as a 10, 20 or 40 minute timer so you can customize your treatment. Each mode has 4 different massage techniques, and the variety will ensure that muscles will never adapt to the treatment. The self conforming air cushion will provide low back support during any and all activities. Simply fasten the belt around the waist and the air cushion will conform to your back, ensuring that you get the support that you need. The Thermal Pocket is a mesh pocket that can store small heat patches or ice packs. Hot and cold therapy are frequently recommended to help with muscle pain and soreness. The Thermal Pocket enables users to get hot or cold therapy as they are recommended by their physicians, while still getting the low back support from the Pain Therapy Massage Belt. This also means that users can enjoy hot or cold therapy while doing different activities, instead of having to rest and relax like many traditional products require. Please note that the Thermal Pocket cannot be used at the same time as the built-in reusable massage pads. To use the belt for back support, simply wrap the belt around the lower back. Ensure the belt is tight. Can be worn discretely under clothing. To use the thermal pocket for hot or cold therapy, place either a heat patch or a small ice pack into the thermal pocket. Wrap the belt around the lower back, ensuring that the belt is tight. To use the built-in reusable massage pads, lift the Thermal Pocket up to expose the massage pads. The Thermal Pocket can be buttoned down to ensure it does not get in your way. Connect the black and red-tipped wires of the massage pads to the long, white wire. Connect the other end of the wire to the Pain Therapy Device. Remove the plastic covering that is protecting the massage pads. Wrap the belt around the lower back, ensuring that the massage pads are fitted against the lower back. Turn the Pain Therapy Device on, selecting the mode and timer as desired. After treatment, replace the protective plastic covering over the massage pads, then replace the thermal pocket. You can continue to use the Belt for support, or hot or cold therapy, as desired.